Help your students achieve their best on the exams with authentic and sophisticated phrases. 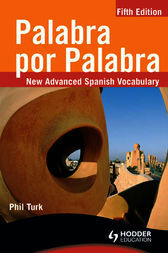 This new edition of the bestselling A Level Spanish vocabulary reference book provides idiomatic phrases drawn from real sources such as newspapers, magazines and websites to ensure the most accurate and authentic language. More vocabulary lessons available online at Vocab Express, an interactive learning application. Visit www.vocabexpress.co.uk/hodder for more information. Phil Turk has had many years experience as a language teacher and textbook author.